Whew, I made it to the Philippines!! It’s great to be here, but that also means my Rilakkuma adventures will slow down significantly from the past week – which is totally okay because I have a huge backlog of plushies/hauls to photograph anyway haha it’s good to finally get a chance to slow down a bit. On my last morning in Japan, I finally got my hands on something from the Rilakkuma x KFC collaboration: an Aloha Rilakkuma fan! Most importantly, I finally got the box!! As I mentioned briefly in a previous post, this is the third set of items from the Rilakkuma x KFC campaign! The fan turned out to be a good choice because yesterday was HOT and we had to wait in line in the sun for the bus to the airport. On top of that, the Philippines was hot upon arrival (like always), so even though I’ve only had this fan for 24 hours, it’s already seen a lot of use! Getting this box/fan was so much trouble – we stopped by a KFC in Kyoto and they had nothing in stock… then in Tokyo, we asked our hotel concierge, and they gave us directions to a KFC that recently closed… then we got directions to one in Shibuya that didn’t carry any smile sets at all… but the employees there finally gave us information to another KFC in Shibuya that did stock the Rilakkuma products that was just a short walk away. Such a tiresome journey, but rather worth it, I think! I did everything I wanted to do in Japan, Rilakkuma-wise! Also, new in the Rilakkuma plushie world: Rilakkuma x Yamanote Line! This collaboration celebrates Rilakkuma’s 10th anniversary AND the Yamanote Line’s 50th anniversary as the green line! In honor of the green Yamanote line and Rilakkuma, Yamanote car #10 will feature a special Rilakkuma design! In any case, I’ll certainly be trying to get my hands on these two plushie designs – one for me and one for my sister! I think more details about this collab will be released in mid-July so stay tuned! ← Rilakkuma x Pizza Hut: Pizza Cutter & Pizza Board! 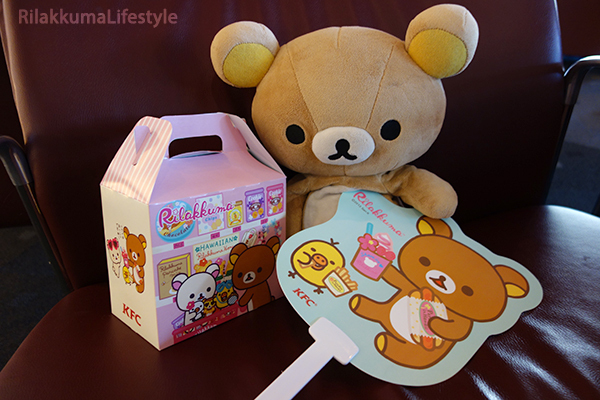 I seriously don’t mind eating KFC everday if only that rilakkuma promotion available in my country. LOL. Such a cute box! Are you continue your vacation to the Phillipines now? Yep I had to get the same fan if not only for kii eating French Fries☺. I like the driver rilakkuma the best such a cute outfit!! Yep, 2 more weeks here in the Philippines! Though since we’re here seeing family, it’s less sightseeing and more family reunions with relatives I haven’t seen in 3+ years. You guys really need to stop posting all these Rilakkuma collabs, I’m going to convert to a Rilakkuma lover and then my wallet will cry even more! Yeah! I feel like even though I was basically running all over the place trying to see everything in Japan, I remember the Yamanote line really well (maybe because it was the big circle haha). Wow you are so dedicated to rilakkuma trying all those kfcs! I’m glad you got it in the end! There’s a KFC down the road from me but I never see them advertising the sets. Omggg I love the new Tower Records release! I might post about it soon once I decide whether or not I’ll order it (most likely the playset, if anything).